I’m not a very assiduous gardener. I enjoy a bit of gentle pottering but confronted by the account of Isaiah’s vineyard, I’m instantly looking for a get-out clause. Surely there’s way too much time and effort being lavished on that vineyard…. Why on earth doesn’t the vintner cut his losses and look elsewhere. Because this story is our story...and the story of generations of God’s people…. My beloved had a vineyard, prepared the ground, tended the soil, planted the choicest Vine, the Vine he had brought specially from Egypt...a people to be God's own, and to model God's way of living for all the world to see. Yet this hand - picked people had let God down. For all the care lavished on them, they could not, would not be fruitful. Instead of an abundant harvest of fine grapes to share, they were producing only the tiny, bitter inedible wild grapes..fruit to pucker your mouth and set your teeth on edge. What more was there to do?..an question taken up across the centuries by the prophet Micah , before finding its place in the heart-rending agonising grief of the Good Friday reproaches. How could God love us more? Give us more of God's self? "O my people. What have I done to you? In what have I wearied you? Answer me..."
For Isaiah, here and now is the moment of truth. Looking at the vineyard, God finds no fruit, no justice, no righteousness on this Vine that is God's people, Israel. To be this Vine means to receive God's special care, God's loving nurture...but it means, too, to come under God's judgement. And there is nothing to show him. No harvest at all. "He expected justice but saw bloodshed, righteousness but heard a cry." A well tended vineyard, with not a single grape. It was a theme that was to become heartbreakingly familiar. So God spoke through the prophets again and again..the story of God's care and our neglect, God's cherishing and our indifference. As Jesus spoke to that mixed crowd in the Temple, where priests,scribes and elders mingled with disciples and the curious bystanders, everyone present knew that the vineyard parable was about them, about God's people, the Jewish nation. They knew too that the rejected messengers were those prophets who had tried, again and again, to call God's people back to themselves...and to their core relationship with God. Had tried to no avail. A Son and heir. Now we are onto unfamiliar ground...we enter a new chapter. A Son???. Who knows if the tenants in the parable actually had anything worth offering their landlord. Maybe, rather than cheating him of his profits, they were simply trying to hide their own fruitlessness. They knew his hopes and expectations, but knew too their own complete failure.They had nothing to offer, no matter how many messengers, prophets, sons were sent. Israel, called to be a light to the nations, a people shaped each moment by God's law of love, had become instead a people bound and defined by other laws, a people intent on protecting themselves not for the sake of the fruit they might give to the world but for their own security, hanging on for dear life to an identity that had lost its purpose. "Good vines require cutting and more cutting. A mile of runners won't give you one more grape, so get rid of the branches that don't bear fruit. Do you want to keep everything? Then expect nothing. Cut and then cut some more." Does that sound terrifying...something beyond our highest dearest aspiration? Are you, like me, left scrabbling for good news in the dirt of a vineyard that seems to be so much less fruitful than you'd hoped? Then remember that Jesus also said I AM the Vine...not simply the one in whom God's fullest intention for Israel is made good, but the one whose runners stretch even into those places of least fruitfulness, the one who is inextricably involved with our barren hopes, our wasted efforts, our inertia, greed and fear. Jesus the Vine is connected with us in those places where we are furthest from God's will and God's pleasure...Indeed he is here scrabbling with us in the dirt as we look desperately for some harvest worthy of the name. Today Holy Week begins and as we walk again the way of the Cross, it is to discover for ourselves that the whole story of humanity, of God's love and our intransigence is focussed on the person of Christ as he moves towards Calvary. If we follow him closely, the sorrow and love that drops from the crucified one will transform our barren vineyards, softening our hard ground and harder hearts til we are fully human once more. A shoot shall spring up from the stump of Jesse...the Vine shall be renewed, its branches reaching everywhere, to bear fruits of righteousness for there is nowhere beyond the reach of that self giving love. Mourning the brokenness and hurt to such great beauty. We believe that your everlasting arms hold all things steady. Nothing is lost or wasted, but everything transformed and made new. And to trust this for ourselves, and for the world, through Christ, our sure foundation and our Saviour. I first visited this cathedral as a small child – one of the many who came in the 60s to see the wonder that was quite unlike anything else . We DID engage with the ruins first. I remember touching warm stone and thinking “These aren’t ruins – not like my local castle in Hastings at least”...and I’m told that my first reaction on entering the Spence Cathedral was to plonk myself firmly on the floor with my back to the West Screens and announce, with some indignation, “You never told me God was THIS big”. I don’t remember very much about the rest of the visit. I was distinctly alarmed by the tapestry and I obviously liked the Tablets of the word enough to demand a postcard – which found its way into my school Bible...but the moments that I would now expect to be highlights of any tour – the texture of the font, the glimmer of the mosaic in the Chapel of Christ in Gethsemane, and the moment of amazment as the hidden glory of the windows is revealed when you turn at the High Altar...All that passed me by. I was still intrigued by the place, though – and took care to revisist whenever practical through the years. But the human journey which we hope to offer to our visitors just wasn’t part of my experience...not as a child and not, indeed, as a periodic visitor. Certainly my early visits were unmediated by anything except, perhaps, a Pitkin guide. It didn’t worry me. Something was still going on, an inner journey enabled by the space, and it was only when I became an insider , joining the staff, that I realised that there might be a “right” and a “wrong” way to experience the Cathedral. Of course, now I take care to lead them the “right” way – but I’m beginning to think that perhaps I could just trust the building to do its work. If each visit is a conversation between the visitor and the building, perhaps we should sit light to what they want to talk about…understanding that there will be as many different motivations for a visit, as many different needs to be met as there are feet crossing the threshold. Of course this doesn’t mean that an absence of interpretation is acceptable. This building has many stories to tell – of 20th century art and architecture, of the Coventry Blitz and post war co-operation, of enmity and reconciliation, death and reresurrecti – all held within the over-arching Christian story without which there would be no Cathedral at all. We long for visitors to grasp something of each of those – for everyone who comes to have some sort of transformative experience and to realise that there is room for their own story to find a place too. Later God makes it even more clear..."Is not this - obedience to these commands - Is not THIS to know me?" That anyone, anywhere, could imagine that in turning on a community at prayer they were doing right is as baffling as it is chilling, but thankfully in this as in all else the ultimate judgement rests not with you and me but with a God who is truly our compassionate and merciful Father. So, for now, if we want to know God, let’s just do all that we can to carry on obeying God’s commands: to do justly, love mercy and walk humbly – and we will probably be OK. Meanwhile, I think there's even more by way of challenge going on in our New Testament reading as Jesus invites us to carry the cross and to give up all our possessions. It’s not a great sales pitch, is it? We’d rather have the kind of Saviour who invites us to follow his triumphant procession, caught up in the slipstream of his glory, cheered on by adoring crowds. I can’t imagine that carrying crosses was on anyone’s wish list for a happy outing, not then and not now. – certainly not mine. But we can’t say that Jesus didn’t warn us. He didn’t promise an easy ride in any way. We’re going to have to change, you see. I think perhaps the subtitle for the New Testament reading might be “Know your Ts & Cs”, terms and conditions. You see there is a cost. Not a charge, but a cost nonetheless. Yes, it's easy to get carried away, to build castles in the air about changing the world for God but there are important things to remember. This journey of grace costs us nothing in some respects...God's love is truly an unconditional free gift, his amazing welcome open to us all, no matter who we are or where we come from. But....it's a journey that will change us. You can't fall in love and expect to have every other area of your life left untouched. You can't opt to follow Jesus and be unchanged by your decision, not because he demands it but simply because that's the way things are. To follow Jesus means longing to be more like him,and that transformation will involve many choices that feel distinctly uncomfortable as our egos are manoeuvred into second place. I don’t know what your cross might look like – what your struggles might entail – but I’m sure they’ll be real and hard. We are asked to pick up something we DONT imagine we want – that personally tailored, individually crafted cross – and to let go of things that we have valued so much that there’s a real risk that those possessions have come to possess us. That’s not the easiest of exchanges, I’m afraid. On the whole, when it comes to possessions, I don’t think material things are likely to be the big issue. It’s more about those ideas that form our world view, opinions that have become facts to us, sweeping generalisations that we take on trust, or maybe even that unconscious privilege which means we no longer notice the lens through which we view reality. The point is that serious discipleship does involve submitting to discipline. The clue is in the word. God loves us far too much to leave us as we are. We are invited to risk a radical transformation, to give up whatever might impede us– to honestly work at following Jesus, and allowing his way to become ours. Can I invite you to consider your own inner landscape afresh. Ask God to help you to identify those habits of heart and mind, those ways of being that we hold so tightly they dominate and distort everything. Then ask for the grace to let go - to leave your hands free to bear the weight of whatever your cross might be. Jesus doesn’t promise us an easy ride, - that's all too true. But the rewards are out of this world and this is, truly, the journey of a lifetime. Today the Knife Angel arrived in Coventry. Standing so close to our two cathedrals, it occupies a good place to plant seeds of hope, inviting us all to reflect on the choices we make in life. Of course, we’re no strangers to loss, pain and destruction here, nor to making positive choices when another route might seem so much easier. I can’t imagine that Provost Howard was universally popular when, in 1940, he responded to the Coventry Blitz not with hatred or anger but with the two words which are still present in the apse of the ruined cathedral, “Father forgive”. The power of the missing word is, I believe, Coventry’s greatest gift to the world, for where there is no “them” you are prevented from “othering” anyone, forced to recognise that we all have potential for both good and evil, that the choice is ours. The Knife Angel, looking down at his own empty hands, is not a figure of power but of helplessness. He seems to be asking “Why? Why?” and, like us, has no answer. While our own patron Michael, the Archangel, is confidently beating down Satan under his feet, - an angel sure of ultimate victory - Alfie Bradley’s Angel finds himself unarmed and uncertain, still in the midst of the struggle. Under his questioning gaze we can perhaps gather our thoughts, our longings for peace in the city, and make our own choice, to opt for a better tomorrow in which violence and hatred have no place. 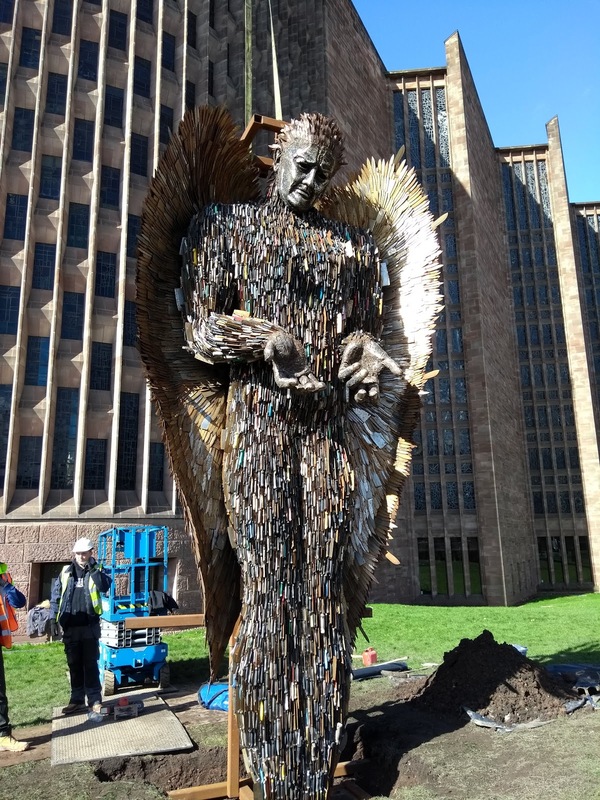 In making something beautiful from the ugliness and violence of the knives Alfie follows a pattern that is part of the Cathedral’s own DNA – using the pain of the past to build something brighter and stronger – a peaceful future. Of course we must not imagine for a moment that, having welcomed the Knife Angel, we have done our bit to stand against knife crime. The causes are many and complex, but the over-riding absence of hope in some parts of the community must surely be a significant part of the picture. I was particularly sad to hear how often victims are knived with their own weapons…in other words, whatever the popular narrative, carrying knives does not make anyone safer…Those who have been hurt are too often the very ones who brought weapons to the scene. This year we’re exploring the mess and muddle of 21st century Britain in our Cathedral Lent course, based on the BBC series, Broken. Ethics look different when viewed from a perspective of grinding poverty and I’m so conscious of the sheltered viewpoint I still have. My hope and my prayer is that while he is with us, the Knife Angel will help us to review not only our own choices but the provision for those who may feel they have no choices at all. 25 years ago, my youngest child was a cold-ridden toddler having an uncharacteristically fractious and clingy afternoon. I don’t remember much of the service itself. Already, newly licensed as a Reader, I was getting weary of the comments round the village “It will be your turn soon, Kathryn.” “Nothing to stop you now”. I wasn’t ready to be called, was still sticking my fingers in my ears and singing as loudly as possible to drown the inner voice which became non-negotiable as I received Communion at the Gloucester ordinations from Viv Faull (fast forward to today, and she is, of course Bishop of Bristol). Even so, it took me a further 11 years before I actually knelt in that beloved Cathedral. Send down the Holy Spirit upon your servant Kathryn for the office and work of a priest. 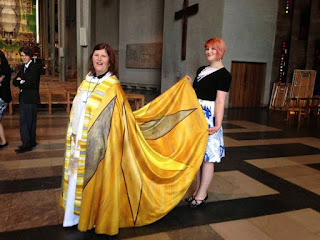 Talking to FabBishop (newly consecrated and arrived in our diocese just weeks before my ordination as Deacon) he was full of joy at the celebration of those first 10 years, but said “I hope we can just forget it now…that you’ll be able to simply exercise your ministry without gender being an issue at all. Let’s aim not to NEED to celebrate 20 years because women’s ministry has become so normal, such a fundamental part of the life of the Church”. He worked and fought and encouraged and blessed so many as he tried to help the Church move to that place, and in the days that followed the vote against women bishops in November 2012 I’m not sure that some of us would have remained fully functional without his love and care. It is a huge joy that when he retired, Bishop Rachel took his place in the See of Gloucester, and that it continues to be a place where the ministry of women is fully affirmed, absolutely and non-negotiably part of the fabric of the place. Coming here, I was greeted with an enthusiasm that suggested there was still something a little unusual about a woman in a senior role. That’s changed over the past 5 years, one important landmark the appointment of Archdeacon Sue last year, but still I’m conscious of places where I and my sisters aren’t welcome to preside, where we may hear mutterings about “priestesses”, - and of others where we are patronised or over-celebrated, as remarkable beings, symbols of more than any woman could possibly aspire to. I think it was C.S.Lewis, many years ago, who nailed the syndrome as either “The women – God help us! Or “The ladies, God bless them!” Neither is helpful! Of course there are many many amazing women in the priesthood. Lots of them are my friends. There are many many amazing men in the priesthood. Lot of them are my friends too! I dream of a Church where we are all alike enabled to flourish in this God-given ministry as priests without any additional labels. We are not in competition. Following a vocation should never be a matter of gender politics but of obedience to God’s call. Today I am thankful for those who made this possible for me, for those who battered down doors so that I could walk through them, for those who encouraged and pushed and nagged me to answer the call, and who continue to walk beside me in this ministry that I love. We've been doing a spot of digging just outside the Cathedral. The Knife Angel is due to arrive in town on Thursday and needs a good firm foundation for the 100,000 blunted knives that make up the 27 foot high sculpture...so a mini digger has been at work. Of course, because the Spence Cathedral was built on land that included the churchyard of the medieval St Michael's, digging in these parts often means that some bones come to light...and last week was no exception. Tools were downed and the police summoned, to confirm that these were definitely ancient bones - no possibility of a suspicious death so all we needed to do was to gather them carefully and restore them to the ground reverently. Old bones seeing the light unexpectedly...A dirt encrusted iron handle, perhaps from a coffin, made me decide these were not medieval remains - so when we reburied them, I used the Prayer Book, rather than a Latin Requiem. I held those fragile remnants - a broken adult skull, a much smaller one, - a child, perhaps, - and some assorted other bones. I wondered about their stories...when had they lived, and died...I thought about the premature deaths, the culture of knife crime into which the Knife Angel speaks...and reflected that the same words would be used in a Christian committal, regardless of the circumstance, words that have spanned the centuries because they are true. "Earth to earth, ashes to ashes, dust to dust..."
On Ash Wednesday, at the lunchtime Eucharist, I ashed a toddler. She might have been as old as 3, but certainly no more. Full of joyous energy, she had squiggled and wriggled and explored through much of the service - but in a way that I found quietly enthralling, rather than distracting. When her mum came up for ashing, she carried her in her arms. I wasn't sure how she might feel about a strange woman drawing on her face - even without my speaking of our shared mortality - but she turned out to be very keen, brushing her fringe out the way so that I had a clear run at it. When it came to it, though, my nerve failed me. I told her that she was made to reflect God's light and love and asked to follow Jesus all her days. Humankind cannot bear too much reality - and I couldn't cope with bringing the reality of death and the warmth and life of that little one together. But "golden lads and girls all must, as chimney sweepers, come to dust" - and beyond the dust is the sure and certain hope of resurrection - so I'm rather cross with myself for ducking the issue. Made in God's image, she deserved to hear the truth - and the hope that lies behind it. Rejoice, O dust and ashes, the Lord shall be your part. His only, his forever, thou shallt be and thou art. The Jordan is a most disappointing river…. "more history than water", said our guide – and certainly there wasn’t much to impress, not worth the detour for the casual tourist. Muddy, reed-lined, and now, rather terrifyingly, approached through a minefield it was, for us, a significant but not an encouraging stop on our Holy Land pilgrimage. 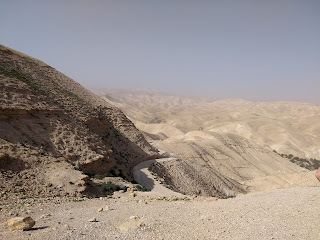 We had made the journey in reverse – travelling from Jerusalem to Tiberias, via the barren majesty of Wadi Quelt , the wilderness valley that forms part of the Jerusalem/Jericho road– and oddly, for all the inhospitality of that landscape, it was a place that drew me, somewhere I long to return to walk and think and negotiate with myself, and with God. Perhaps it’s one of those “thin places” we heard about last week...somewhere that the Spirit is still active – still leading people in the Wilderness as they attempt an inner journey. But 40 days?? That sounds rather beyond me - though I guess that 40 days of thinking/praying and negotiating is exactly what Lent is about. Today’s Collect emphasises that it was here that Jesus was tempted, as we are...and of course that matters hugely. We are following his pattern, and this is a time for each of us to consider where our own temptations are….as individuals and as a community...and to form our own responses, for good or ill. Right now may well feel like a wilderness moment in our common life...the political landscape is every bit as rocky and dangerous as the stony tracks through the Judean wilderness. The beautiful dream of international co-operation from which our Cathedral was built seems to be crumbling around us...and this city that we love is a place whose young people are afraid to come into the centre for fear of knives after dark. A desolate landscape indeed...so, what temptations face us here? Might our experiences find their counterpart in those that Jesus faced? And can we draw strength and direction from his responses? For Jesus, each temptation invited him to be LESS than his true self ...To have yielded to even one of them would have been to change the entire shape of his ministry. That inner voice of temptation is very crafty....These are not questions of chocolate or single malt or even that expensive sports car guaranteed to make you feel younger and more exciting - but instead something far more important...how Jesus will inspire people to follow, and engage with building the Kingdom. Will he go for the quick fix and the easy win, take a short-cut through the desert? What harm could it do. He was famished, after all. 40 days is a long time to fast. After all, God once provided manna for his people in the wilderness...and Jesus could surely do the same – but to do so now would be to cheat...to step outside the limitations of his humanity, just for his own benefit. And so he will have none of it. It can be a temptation for communities too. We might, perhaps, fall into the trap of thinking ourselves a bit special here – and of beginning to imagine that we exist to safeguard our own existence...for the greater glory of Coventry Cathedral, if you like. But remember “The Church is the only organisation that exists for the benefit of those who are not yet members” . We cannot relax, well fed with beautiful liturgy that speaks to our souls, if we’re not prepared to use the beauty of this place that we love to reach out and feed those who can’t imagine that they’ll find anything to draw them through our doors. Jesus, of course, stays true to himself but next comes the temptation of power, an easy route to victory – all gain with no pain. To yield would mean Jesus ruling the world – but enthralled to the will of another and thus so much less than himself. Later Jesus would show all times and all people that God's power is made perfect in weakness, - for the greatest moment of his glory was when he was lifted on the cross, in powerless vulnerability. That's counter-cultural, counter- intuitive - and something it's hard to imagine opting for. Ironically, of course, though Jesus has emptied himself of all his heavenly power – it belongs to him as of right. It is never Satan’s to give...this is an empty, delusory offer. It might seem appealing – the idea that we are monarch of all we survey – but the strength of our cathedral is actually rooted in brokenness. It is in the ruins of something that once looked strong and beautiful that we find the impetus for a work that we would never otherwise have attempted. We wouldn’t have chosen to be broken. If we had interviewed Provost Howard in 1939, I'm sure his prayers for the cathedral would not have included one asking for its destruction– but it was then that Coventry Cathedral was given the vocation that still draws people here. We had to be broken to find ourselves. God’s power was made perfect in our weakness, our brokenness. That’s never comfortable – but it IS certain. If we find ourselves frustrated that we can’t simply fix things – that’s OK too. The power is not ours...and we delude ourselves if we believe or behave otherwise. For now Jesus simply asserts that all worship belongs to God...worship offered elsewhere is meaningless and empty – the point of this wilderness journey is to learn to put things back in their proper order...God first. Finally Jesus is encouraged to make God PROVE that he cares. Does that conversation strike a chord for you? I've certainly had moments when I've asked God to show me unmistakeably that I matter...often with rather silly suggestions as to how that might best be managed. I'm really not great at remembering in my heart as well as my head that I matter to him. Jesus, however, is the proof of God's love – not a needy recipient of it....and in this 3rd exchange we hear him coming into his own identiy. He is secure in the knowledge and love of God. Full of the Holy Spirit, he has no doubt that he is both Lover,Beloved and Love itself…. It is, though, through these temptations that Jesus discovers his true identity and the course he is to take. He reveals something of the relationship between Father, Son and Spirit, which is founded on unconditional, unwaveriing love. The Spirit leads Jesus in the wilderness, because the Spirit leads him everywhere. And against the odds, against even our lived experience, the same holds good for us too. We are never alone....and those wilderness experiences, those times of desolation, are also the times when we have room to grow, and to discover both the truth of who we are and the wonder of who GOD is as well. That’s our invitation, as individuals and as a cathedral family. To discover the truth of ourselves and the truth of God. To go into our own wilderness to seek God in the silence of a less cluttered landscape. To learn to be God's people. “Life is for love”, said Augustine, “Time is only that we might find God”. and so the wilderness experience is something to be welcomed and cherished. It’s an opportunity to listen more attentively, and in the sparser landscape that we have created by our Lenten abstinence, to gain a new perspective and discover what really matters. Even in those apparently unfriendly surroundings the Spirit is present, leading us, helping us to strip away the small deceits and distortions that we've come to rely on, enabling us to increase our conscious dependence on God. Can I, then, invite you, as you travel through Lent this year, to hold those words “To learn to be God’s people once again” in your hearts and in your prayers? Ask God how best we can be God’s people together, here at the Cathedral Church of St Michael – how best we can collectively show our love for God with all our hearts and minds and souls and strength – how best we can love our neighbours – the skate boarders in the square, the rough sleepers who leave needles and mess behind them on our campus every morning, the many many people who walk past seemingly oblivious to this building and whatever may happen within it. We may not like the answer – but to attempt anything less is to walk away from our calling, as surely as if we’d chosen to turn stones into bread, dropped to our knees before the father of lies or leapt hand in hand off the Cathedral tower. 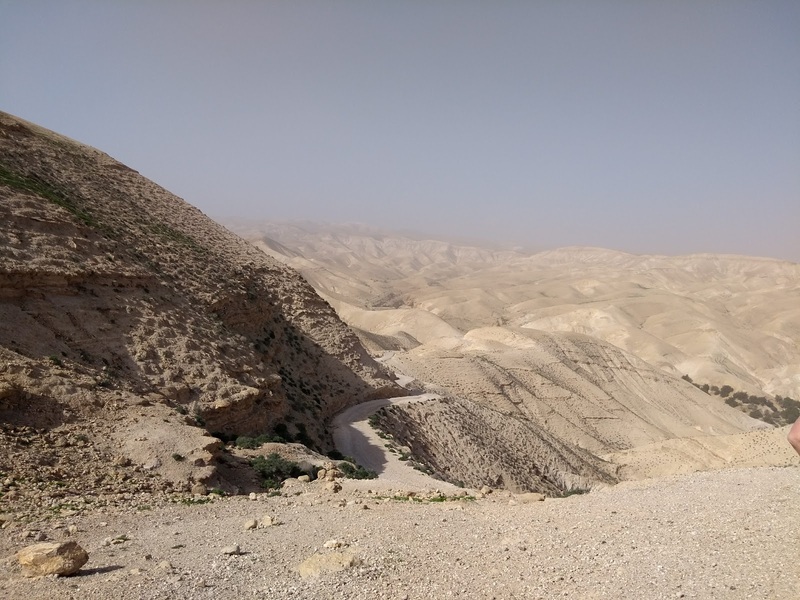 As we travel through this desert together, may we remember our collective name, our shared idenity in Christ – and then may we live it in all its transforming hope and joy. Our Exodus reading tonight is the second chapter in the story of Moses...and might have been entitled "Moses, the wilderness years," if there weren't 40 literal wilderness years still to come. After the amazing escape of the baby in the basket, after the cosseted upbringing of the young Priceling in Egypt, things have taken a turn for the worse for our hero. He has committed manslaughter in a misguided attempt to defend a fellow countryman, and fled from Israelites and Egyptians alike, to live as an alien in exile in a foreign land. He has a less than glamorous job, looking after his father in laws sheep...and thats what hes doing on this day when everything changes. Amid the rocks and boulders, the familiar if unfriendly landscape of every day, suddenly an extraordinary sight catches his eye. Where are those spectacular signs we read about in scripture. Why don't they come our way? They sound so exciting. ..changing everything in an instant. Wouldn't you just love that? Dahoud, the endlessly enthusiastic guide on my Holy Land pilgrimage, came up with all sorts of horticultural explanations for what was actually happening when Moses caught sight of the bush flaming merrily...Perhaps, then, the bush itself wasn't a miracle after all, but some kind of natural phenomenon. Really it doesn't matter. Whatever the cause, we're in the realm of miracle because, you see, tired, disheartened Moses found a spark of interest lighting up his inner landscape too. A spark bright enough to stop him in his tracks, compelling enough to persuade him to take a closer look.. He might have rationalised the wonder, as I find myself too prone to do. He might have walked away. The bush was just there, doing nothing beyond being. It wouldn't have pursued him down the track, demanding his attention. That's never how God works. He might have felt it was time to head home. He might not even have noticed. So perhaps the miracle was Moses' diversion, which took him so close he could see a greater wonder. This burning bush, for all its dancing flames, was not burning up. We all know the principle of fire which needs fuel to feed it. In my last vicarage we had a wood burning stove, which I really loved, except for the rate at which it consumed logs...two baskets in an afternoon. And when they're gone, they're gone. You can't take them off the pyre and restore them to the woodpile..But this fire in Exodus burns and is not consumed. He discovers that this unpromising spot half way up a mountain is actually utterly amazing. We have God's word for it. He says it to Moses, and if you listen, you'll find that he says it to you too. This, THIS is holy ground. God has always been present in that landscape, and every landscape....always waiting for us to turn towards our moment of encounter. On Wednesday Lent begins, with its annual invitation to stop in our every day lives, to turn aside and discover God waiting for us, making our landscape holy, calling us to new work, new ways of being. The God of Moses, of Abraham, Isaac and Jacob is our God too....present and active in this time of anxiety and confusion as he was present and active for disheartened Moses, and for captive Israel.